Virat Kohli has been ruled out of his much-hyped Surrey stint after suffering a neck injury during the IPL. He is expected to be fit for India’s tour of Ireland and England, commencing June 27. 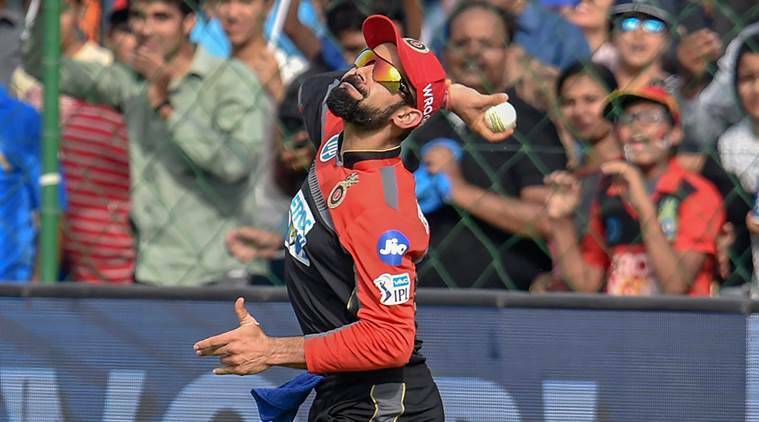 According to a BCCI press release, Kohli suffered the injury during Royal Challengers Bangalore’s IPL match against Sunrisers Hyderabad at Chinnaswamy Stadium on May 17 following which the board’s medical team assessed him. According to reports, the India captain also consulted an orthopaedic surgeon at Khar Hospital in Mumbai. He will now have a period of rehabilitation before starting his fitness process from June 15 at the National Cricket Academy (NCA) in Bangalore. “Team India Captain Mr Virat Kohli suffered a neck injury while fielding during Match 51 of the VIVO IPL between Royal Challengers Bangalore and Sunrisers Hyderabad on 17th May 2018 at M Chinnaswamy Stadium, Bengaluru. Mr Kohli, who was scheduled to play for Surrey CCC in the month of June, has been ruled out from participating. “This decision was taken following assessments by the BCCI medical team, subsequent scans, and a specialist visit. The Team India captain will now undergo a period of rehabilitation under the supervision of the BCCI medical team. He will begin training and subsequently undergo a fitness test at the NCA in Bengaluru from June 15. The BCCI medical Team is confident that Mr Kohli will regain full fitness ahead of India’s upcoming tours to Ireland and England,” the release said. Surrey, on the other hand, expressed their disappointment over losing out on their marquee signing. “It’s hugely disappointing that Virat won’t be joining Surrey for the month of June, but we understand injuries happen and we have to respect the decision of the BCCI medical team to pull him from his stint with us,” Surrey Director of Cricket Alec Stewart said. Kohli was due to play for the English county in all formats, including three Championship matches, next month. The India skipper wanted the stint as part of his preparation for the upcoming England tour, opting out of India’s one-off Test against Afghanistan in Bangalore, starting June 14. It created friction within the Board, with some officials criticising the Committee of Administrator’s (CoA) decision to allow Kohli to play county cricket, skipping a Test. CoA head Vinod Rai, however, held firm, describing the whole process as “macro-level planning”. Kohli had a forgettable Test series in England in 2014, when he scored 134 runs in 10 innings. Kohli, though, played against Rajasthan Royals in Jaipur on May 19, two days after picking up the neck injury. A cricket board official questioned the process. PTI adds: India and Royal Challengers Bangalore captain Virat Kohli said he was “deeply sorry” for RCB’s failure to make the ongoing Indian Premier League’s knockout stage and vowed to turn things around next season. RCB finished third from bottom after losing eight of their 14 matches, let down by a weak bowling attack and inconsistent batting which was heavily reliant on Kohli and AB de Villiers. “We could not pull our way and we are not very proud of how the season went for us. (I’m) deeply hurt by how we played… deeply sorry for not living up to the expectations of the fans,” Kohli said in a video posted on his Twitter page. “Having said that, it is all a part of life and you cannot always get what you want. It’s upto the players to understand what to do about this the next season, really want to turn things around next season,” he added. RCB did show some late spark in the round robin stage but the turnaround came a little too late for them to have any chance. “Next year, we will be putting in more effort,” Kohli asserted. Kohli is currently sixth in this year’s list of top IPL scorers after amassing 548 runs at an average of 54.80 in 14 matches. De Villiers stands ninth in the same list with 480 runs at an average of 53.33.